Let's take a tour of the Registry Valet Barcode Scanner Software. Below are the screens which make up the scanner software that your customers will use to add items to their gift registry or wish list in your store by scanning barcodes next to each item. This is where it all begins and where you can apply your own branding. 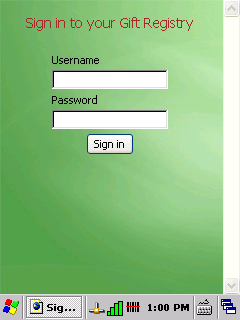 Customize the scanner's gift registry sign-in screen by uploading your own custom wallpaper. At 320 pixels by 240 pixels, there is plenty of room to include your company logo, marketing messages, or other graphics to customize the registrant's experience as they use the scanner. At this point, the customer is signing in to their gift registry or wish list online so at the exact instant that they are making changes to their gift registry on the scanner, their registry is being updated in real time. 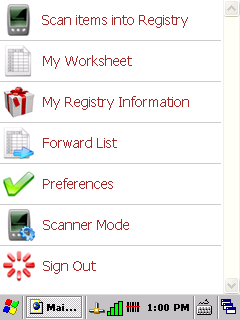 There is no need to sync the scanner with a computer in your store or upload data to the online gift registry software. From here, there are many things the customer can do with their gift registry. Scan Items into Registry Tapping this item will bring up the scanning software screen where items can be added to a gift registry by simply scanning a barcode. My Worksheet On the worksheet page, "desired" and "purchased" quantities can be updated and items can be removed from the list. 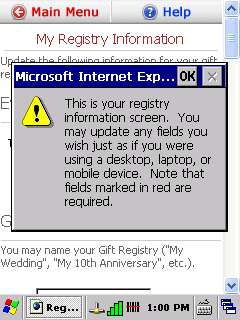 My Registry Information Here the customer can make changes to their basic gift registry information just as if they were using a desktop, laptop, or mobile device. 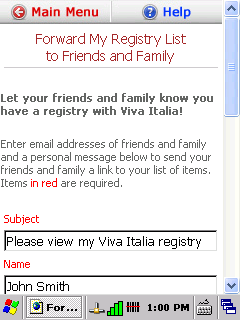 Forward List The gift registry or wish list can be forwarded to friends and family right from the scanner. Preferences The registrant can update their gift registry preferences to hide their address on their online gift registry and hide the purchased quantities so that gifts are a surprise. Scanner Mode There are two different modes (discussed below) that the customer can select to make scanning items most convenient for them. Sign Out The customer can sign out of their gift registry when they are done adding items or making changes to their gift registry or wish list. Using the tethered stylus, all the customer has to do is tap the option they want to use or function they want to perform. The software is extremely user-friendly! The heart of the scanning software, the scanning screen is where the customer will spend most of their time using the scanner. The scanner works by filling in a form field with the numeric representation of the scanned bar code. The software automatically submits the form when the UPC code is scanned. If you use one of the Agenne ecommerce software systems, the scanner software is already integrated. If you use another commerce platform, you can quickly and easily integrate the scanner software into your system using our simple API. 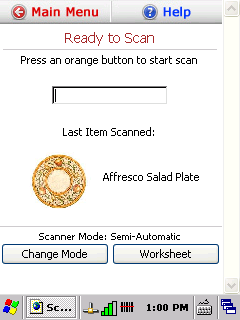 Once an item has been scanned, and depending upon the currently selected scanner mode, the screen will display the last item scanned and buttons to change the scanner mode or visit the worksheet. 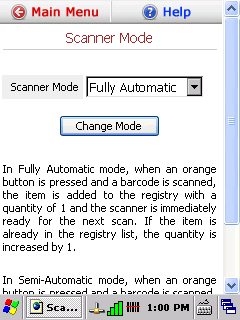 If the scanner is in semi-automatic mode, there will also be a quantity field and an "Add" button. Using the scanner is very easy and intuitive. Three scanning buttons, one located on the left side of the scanner, one on the right side, and one on the keypad, make the scanner convenient for both left and right handed users. In the full sized version of Registry Valet gift registry software as well as the mobile app, the registrant can access and update their gift registry worksheet. But they can also use their worksheet right on the scanner! 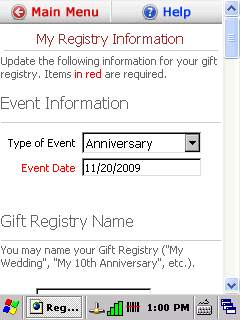 Tapping the My Worksheet link on the main menu will bring up the gift registry worksheet screen. 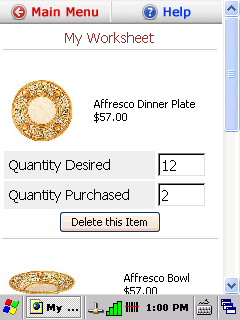 On the worksheet, each item is displayed including an image of the item, the "Desired Quantity" and the "Purchased Quantity". The registrant can change these quantities and delete items from their gift registry or wish list if they so choose. When a customer creates their gift registry or wish list, they fill out a form which contains their name, the name of their co-registrant (if any), event type (if it is an event-based gift registry), shipping addresses, preferences, and so forth. This information can be edited in the full sized version of Registry Valet or using a mobile device, but it can also be edited right from the scanner! All form fields are included in the scanner software registry information form so the customer can update any part of their registry information that they choose. Once the registrant has added items to their gift registry, they can forward their list, via email, to friends and family right from the scanner! A bride, for example, might want to send the list to her mother or fiancee just as soon as she has finished adding items and editing quantities. The email form includes the name of the registrant, their email address, a subject, and a text block that the registrant can use to enter a custom message to send along with a direct link to their gift registry or wish list. By default, the three addresses, (main address, shipping address before the event, and shipping address after the event) are visible to shoppers who visit the registry. 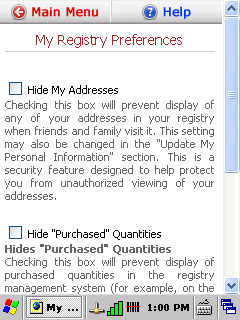 The registrant (bride for example) can choose to hide these addresses for added security. If the registrant wants to be surprised (at a wedding shower or baby shower, for example), they may wish to hide the purchased quantities on the worksheet. If the registrant has hidden the purchased quantities, if they sign in to their registry, even on the scanner, the purchased quantities will not be visible. Choosing to hide the purchased quantities will also suppress the automatic alert email which is sent to the registrant when a purchase is made from their registry. The first scanning mode allows the customer to scan one item after another with each one being added to the registry with a quantity of 1. Once they have added items to their registry or wish list, the customer can use the built-in worksheet to change quantities or delete items that they may have added by mistake. The second scanning mode allows the customer to scan an item and then enter the quantity that they want to add to their registry. This mode is great for registrants that want to add, for example, 12 plates to their registry in one step instead of going back later and updating the quantity on the worksheet. The customer can switch between modes any time they wish while scanning items and regardless of which mode they use, the scanner will return to your preset mode the next time someone signs into their registry on the scanner. Each screen in the scanner software has a context-sensitive help popup to guide the customer through using the software. Help is also included directly on many of the software screens. This combined with Registry Valet's ease of use plus the additional help makes the product scanning experience in your store quick and easy for your customers.